Mit dem Touchpad zeigt HP, dass das von Fachleuten hochgeschätzte Web OS zu Größerem berufen ist. Dennoch ist die Zukunft des Betriebssystems unsicher. Mit dem Touchpad für 579 Euro schickt HP einen ernsthaften iPad-Konkurrenten ins Rennen. WebOS lässt sich intuitiv bedienen, bietet tolle Funktionen, und der Browser zeigt auch Internetseiten mit Flash-Technik an. Über 15 Millionen Käufer haben sich bislang für ein iPad entschieden und damit einen Tablet-Boom ausgelöst. In den kommenden Monaten haben Unentschlossene die Wahl zwischen unzähligen Konkurrenzprodukten, die mit frischen Ideen aufwarten, vor allem aber an Schwachpunkten von Apple ansetzen. Lohnt sich das Warten? HPs Touchpad hat ein Display im 4:3 Format; alle anderen iPad-Konkurrenten nutzen dagegen Breitformate. Unter den Tablet-Neuheiten stachen die Kandidaten mit Googles Android 3.0 besonders hervor - die für Tablets optimierte Plattform-Version überzeugt. Mit dem Touchpad demonstriert HP, dass Web OS für mehr geeignet ist. Der Spaß lässt sich auf ein größeres Format bringen. 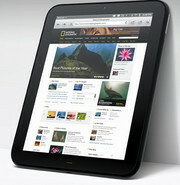 The HP TouchPad is the most worthy competitor to the top-of-the-tablet-heap Apple iPad. There's room for improvement, but webOS 3.0 has the secret ingredient that iOS has always had, and that Google's Honeycomb still seems to lack: It's fun and simple to use. "Cards" and "stacks" are a fresh approach to not only multitasking, but organization, and HP's Synergy allows for useful integration of files like photos, grouping together your various collections from Facebook and the tablet's photo gallery itself. It remains to be seen whether the nascent tablet space will mimic the MP3 player category and eventually dissolve except for one strong leader, or if the realm of tablets is merely emerging and has yet to fully take shape. The HP Touchpad reminds me of the Microsoft Zune HD ($219.99, 4.5 stars) in that it is a very solid device, but may be too late to the game. We've already seen two iPads, and the third will likely arrive sometime around the TouchPad's nine-month birthday. Can HP convince developers to make enough meaningful apps for the TouchPad to help the tablet reach its full potential in the following nine months? I hope so. When all is said and done, the HP TouchPad is a hard sell. It retails for the same price as Wi-Fi only iPads of the same storage capacity yet it's less robustly built, heavier, lacks a rear camera, is slow and has a vastly inferior quantity of apps to choose from. Its interface does have some great features, its powerful speakers are a boon, and it's more open customisable nature will appeal to those not wanting to be confined to the Apple way of doing things. But if we wanted to go for something that isn't an iPad, we'd opt for one of the Android tablet competition, which are better-established and offer greater choice. 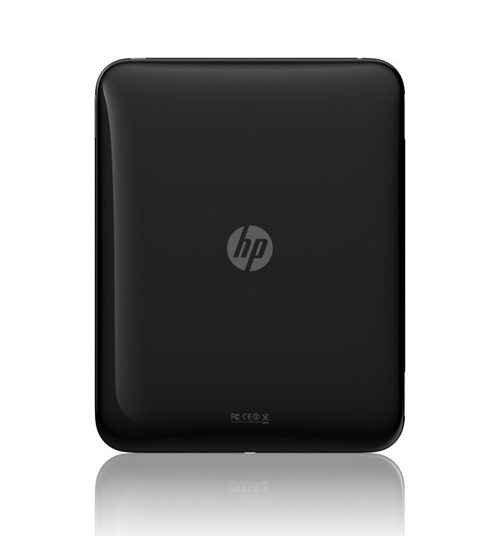 HP's tablet brings a fresh option to the tablet market. The TouchPad has a nice design but is too thick and heavy compared to its rivals. WebOS is a smooth operating system with great multi-tasking capabilities, but currently has a poor selection of apps. Although we like the TouchPad we'll have to admit that the iPad 2 is still king of the tablets. It also wouldn't hurt to pull a Samsung Galaxy Tab 10.1 move and scrap this tablet design to come up with one that is thinner, lighter, and just a better option when placed next to the likes of the iPad 2 and slimmer Android tablets. But until then, the TouchPad is just another also-ran in the tablet category as the iPad continues to dominate the market and capture the public's attention. Once there's a decent Office document editing suite in the App Catalog and some of the glitches are ironed out, particularly in the calendar, HP's TouchPad could be the tablet to beat. Until then however, we'd recommend waiting until these issues are resolved before considering a roll out. If you need to roll out a tablet now, the iPad 2 is still our top pick. But though the TouchPad has many qualities, and would have made a great iPad rival a year ago, today it's too behind-the-curve at too high a price to thoroughly recommend. Obviously there are a number of tablet options out there right now, so why would you buy the TouchPad over a competing device? For one, I like the webOS 3.0 a lot and think it is very easy to use, the learning curve is almost non-existent it’s so intuitive. I also like the fact that the whole setup process is easy and there’s no need to associate your TouchPad with a computer if you don’t want to, other tablets do insist on that which kind of negates the point of using the tablet to replace a PC or Mac if you so choose. The micro USB port which is used for charging and connecting to a computer is great, I’m glad HP didn’t use a proprietary port as now I can use the same cable for several devices. If speakers and audio matter to you, the TouchPad is the best tablet out there for that. The design of the TouchPad is nice, but there are some faults and I don’t think it’s top of its class in the design department. Overall the TouchPad is a solid tablet option if you’re in the market for a tablet, but you do have to put some faith in the fact the app selection will grow in the HP App catalog as it’s just not robust right now and lags competitors. What’s in the app market place now is all high quality and there is no bloat of frivolous and useless apps, so that’s a good thing. Hopefully HP keeps a tight control of making sure only quality apps are released into the market as I think the race should not be for “more” but rather “better” apps and to me that would help the TouchPad stand out in a different way. It remains to be seen whether the nascent tablet space will mimic the MP3 player category and eventually dissolve except for one strong leader, or if the realm of tablets is merely emerging and has yet to fully take shape. The HP Touchpad reminds me of the Microsoft Zune HD ($219.99, 4.5 stars) in that it is a very solid device, but may be too late to the game. We've already seen two iPads, and the third will likely arrive sometime around the TouchPad's nine-month birthday. Can HP convince developers to make enough meaningful apps for the TouchPad to help the tablet reach its full potential in the following nine months? I hope so. HP's TouchPad is a brilliant first entry from HP in to the tablet market. It is slick, intuitive, powerful and looks stunning. 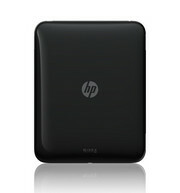 It is also very well priced against the competition to give HP and edge. The apps is has are very limited for now but we're hoping it will be supported by developers and sells like hot cakes. I'll be keeping an eye on HP's over-the-air updates, and if the company addresses some of the launch issues, I'll update this review accordingly. Until then, the TouchPad will be a tough sell in comparison with Apple's dominant iPad 2, and even with the nearest Android rivals. Great-sounding audio output, a clean interface design, and the ability to print will not alone sell the TouchPad. None of those middling advantages are likely to help HP in its biggest test: encouraging developers to take webOS seriously. The recent confirmation that talks to license the platform are ongoing could well do more for it, if HP can get a sufficiently big name onboard. 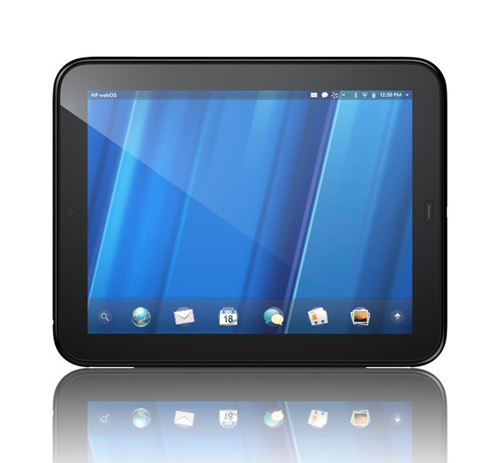 We hope it can, since the biggest shame of all is that, thanks to webOS 3.0, the HP TouchPad offers one of the best tablet experiences around, and we can see many would-be tablet buyers missing out on that while the platform keeps its marginal status. 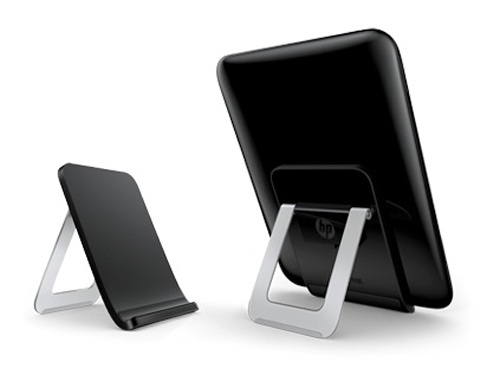 Uninspiring hardware, perhaps, but we’ll happily look past that based on webOS’ charms. There is, of course, the problem of the mobile music service. In and of itself, the TouchPad’s music app is fine. It functions well, and the user interface is unobtrusive. (Read: not fugly.) But consider what the others are offering: Google’s Music Beta allows wireless streaming to any device running Android version 2.2 and above, free of local storage. Apple’s upcoming iCloud requires that you store your files locally, but you can wirelessly sync any iTunes data you already own to your iOS devices from its cloud servers, though it doesn’t do this automatically. Getting music onto your TouchPad is USB-only, and an HP-backed cloud service isn’t exactly in the cards for the near future. If the App Catalog was anywhere near as well stocked as either the Apple’s App Store or even the Android Market, many of these niggles could be overlooked as teething troubles and personal preferences, but at this stage it’s difficult to see where the Touchpad fits in. Still, we like it a lot, and you might like it even more. If you’re a Palm phone user you almost certainly will. All told, it looks very impressive. Whether it will be enough to dissuade buyers from potentially cheaper Android tablets, or those with a few more physical features (like the microSD slot and a rear camera) is something that's a bit early to call. The TouchPad runs the latest version of webOS and HP should be patting itself on the back after acquiring Palm. HP has adapted webOS for a tablet incredibly well – the interface felt very smooth whether we were flipping through home screens, browsing the web or running applications. Five of your favourite applications are stored in a dock that sits at the bottom of the screen. If you want to close an open app, simply flick your finger upwards to push it away. Although this feature has been present in webOS since the very first version, it remains one of our favourite features. HP revealed its contender, the HP TouchPad, last week but MWC has been one of the first chances to get a good look at the device. The 9.7in TouchPad runs webOS and links with the new Pre3 device, all thanks to the company’s acquisition of Palm last year. On the whole, the HP TouchPad is probably the most interesting of all the tablet devices being demonstrated at MWC, but whether that will translate into the most sales later in the year is debatable. We remember the massive interest from journalists and analysts in the Palm Pre, which turned into very few sales to the general public as the iPhone and Android cleaned up. Hopefully HP will get its message across though this time, though, as the former Palm team (now the HP mobile team) has too many good ideas to go to waste. 9.7": Diese Bildschirm-Diagonale ist für Tablets relativ klein. Große Bildschirmgrößen ermöglichen höhere Auflösungen und/oder man Details besser erkennen (zB größere Schrift). Kleinere Display-Diagonalen dagegen verbrauchen weniger Energie, sind oft billiger und ermöglichen handlichere, leichtere Geräte.» Prüfen Sie in unserer DPI Liste, welche Displays wie fein aufgelöst sind. 69.15%: Diese Bewertung ist schlecht. Die meisten Notebooks werden besser beurteilt. Als Kaufempfehlung darf man das nicht sehen. Auch wenn Verbalbewertungen in diesem Bereich gar nicht so schlecht klingen ("genügend" oder "befriedigend"), meist sind es Euphemismen, die eine Klassifikation als unterdurchschnittliches Notebook verschleiern.